The newly released provincial budget provides insight into the allocation of government spending. How will your company benefit from the introduction of new programs and the refunding of existing programs? Proactively discussing funding strategies and eligible projects will help in securing your share of the spending. The Business Growth Initiative will create opportunities to make Ontario’s economy more innovative, help scale up small businesses into medium-sized and large enterprises, and reduce the regulatory burden on businesses. College Applied Research and Development Fund: Launched January 2017, a three-year, $20-million fund to support industry-academic collaboration between Ontario businesses and colleges. Jobs and Prosperity Fund: A 10-year, $2.7 billion fund that helps the government partner with businesses to enhance productivity, innovation and exports. Project commitments to date will support the creation and retention of more than 37,600 jobs, leveraging business investments of more than $7.4 billion. Ontario’s dynamic and diverse manufacturing sector is sustaining jobs across the province and generating most of Ontario’s goods exports. Manufacturing directly accounts for over 660,000 jobs and generates over 12% of Ontario’s GDP. Supported by greater demand and a more competitive Canadian dollar, Ontario manufacturing sales increased over 37% between 2009 and 2016, to almost $301 billion. Managing electricity costs: Ontario’s Industrial Conservation Initiative, which helps large electricity users reduce their bills by providing an incentive to shift electricity consumption to off-peak hours, was expanded to include more than 1,000 newly eligible customers by reducing the threshold for eligibility and opening the program to all sectors. The Corporate Income Tax (CIT) rate on income from resources, manufacturing and processing (M&P) was reduced from 12% to 10% in 2010. Ontario manufacturers and processors also benefit from an accelerated depreciation rate for manufacturing and processing machinery and equipment from 2016 to the end of 2025. Honda: In January 2017, the government secured an investment by Honda of up to $492 million by committing up to $41.8 million for upgrades at its Alliston assembly plant. This includes a new state-of-the-art paint shop and leading-edge vehicle assembly technologies, as well as R&D, and will support future vehicle models while securing 4,000 direct jobs. Ford: In March 2017, the government secured an investment by Ford of over $1 billion by committing up to $102.4 million for projects including upgrades to its Windsor Engine Plant to preserve 500 jobs. The investment also establishes a global Connectivity Innovation Centre with almost 300 new engineering positions in Ottawa, Waterloo and Oakville, along with significant additional R&D expenditures. Ontario’s agri-food sector contributes over $36 billion to GDP and supports over 800,000 jobs across the province. Since the 2013 announcement of the Premier’s Agri-Food Challenge, which involved the sector doubling its growth rate and create 120,000 jobs by 2020, the agri-food sector has created over 40,000 net new jobs. According to the Conference Board of Canada, every $100 million increase in exports creates approximately 1,000 new jobs. 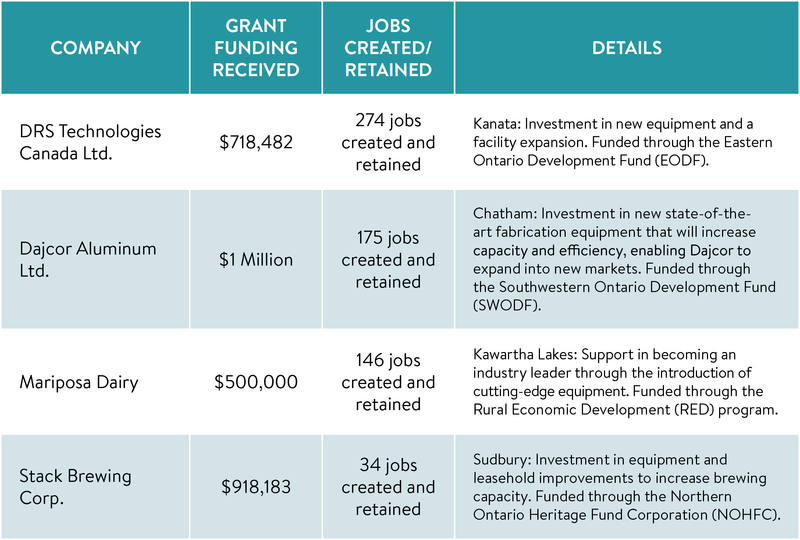 Ontario invested $34 billion over the past three years and is planning to invest $156 billion over the next 10 years. Figures exclude third-party investments in hospitals, colleges and schools.